Are you suffering from email overload? Some of its symptoms include a seemingly unstoppable barrage of marketing emails, the inability to distinguish legitimate emails from spam, and insufficient free inbox storage space. If so, this article is here to help you declutter your Gmail with Gmail email filters and Clean Email, a powerful bulk email organizer compatible with Gmail and many other email services. Why Are Gmail Email Filters Important? 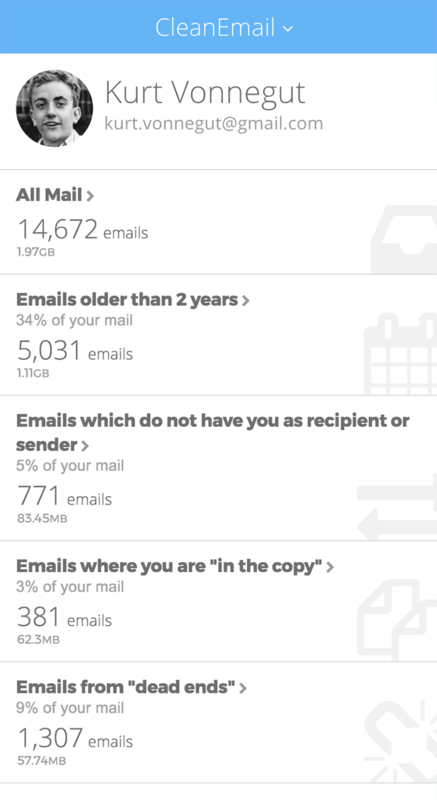 With Gmail, a free email service developed by Google, you get 15 GB of storage for free, but there’s a flip side to having so much storage available for your emails. Most Gmail users never delete old emails, and you might be surprised just how quickly they add up. An average email is about 75KB in size, but that’s not counting pictures, attachments, and complex formatting. What’s worse, Gmail storage space is shared among all Google applications, including Google Drive and Google Photos. That’s right. If you upload 10,000 pictures, each 1 MB large, to Google Photos, you’re left with only 5 GB of storage for your emails and files. You could, of course, pay Google for extra storage space, but there’s a better solution how to get more storage space: Gmail email filters. Simply put, Gmail email filters are rules that are automatically applied by Gmail to new emails. Gmail filter emails may go straight to your email archive, they may be labeled, categorized, or even deleted. When you mark an email as spam, you actually create a Gmail email filter that is executed every time a new email from the same sender arrives. Now that you know what they are, you’re probably anxious to know how to automatically filter emails in Gmail, and that’s exactly what the following chapter is all about. Click the down-facing arrow on the right side of the search bar. From: This filter field allows you to filter emails by who sent them. You can even put multiple addresses here, separated by commas. Subject: You can filter emails based on their subject line. For example, you can move all emails with the word “deal” in the subject to a different folder. 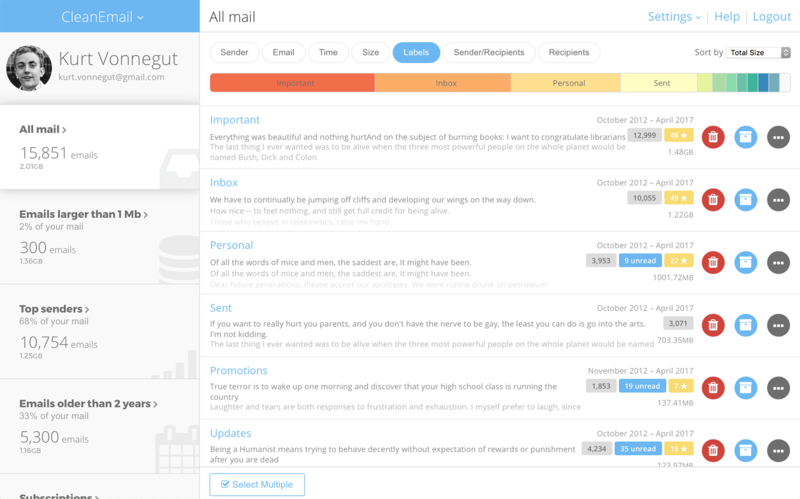 Has the words: Filter emails based on the words they contain. Doesn't have: Filter emails based on the words that are NOT included in them. Size: You can filter emails based on their size, which is useful for cleanup purposes. Date within: Pick a date and time range so that only emails that fall into that date range will be filtered. Search: Specify which folders your filter should apply to. Has attachment: By enabling this option, your filter will apply only to emails with at least one attachment. Don't include chats: Enable this if you don't want chats included in your filter. Click the “Create filter” button. As you can see, it’s a lot of work to learn how to work with filters in Gmail, and their capabilities are quite limited. Fortunately, you there Clean Email, and easy-to-use bulk email cleaner with sophisticated automation features that makes native Gmail filters look clunky and outdated. Clean Email takes Gmail email filters and inbox management to another level with its smart algorithms and powerful automation features. When you give Clean Email the permission to analyze your Gmail inbox (don’t worry its algorithms only analyze email headers that contain subject line, sender and recipient information, dates, email size, and similar metadata), it groups similar emails into easy-to-review bundles that you can then remove, archive, move, label, and more with a simple click. Clean Email can create bundles for bounced email notification, emails sent or received long time ago, subscriptions and newsletters, emails from email addresses you know and recognize as safe, emails where you are copied, miscellaneous notifications, junk emails and spam, your top senders, emails which do not have you as recipient or sender, emails to yourself, large emails, finance emails, emails from dead ends, social network notifications, travel emails, notifications from project management tools, emails your replied to, online shopping emails, and so on. Each time you apply an action to a bundle of emails, you get the option to apply the same action automatically in the future. You can, for example, automatically move all emails from Facebook to a different folder or mark all emails from your top sender as important. Thanks to its intuitive user interface, which makes all of its features easy to understand, learning how to filter unread emails in Gmail or how to filter incoming emails in Gmail using Clean Email is effortless. Best of all, you can try Clean Email for free in less than a minute, and it works with most other popular email services, including Yahoo, Outlook, iCloud, Fastmail, AOL, Office 365, and others. You don’t want your inbox to turn into a pile of spam and advertising, with a few legitimate emails worth reading buried somewhere deep down. To prevent this from happening, you must step up your email management game and learn how to take full advantage of Gmail email filters. If you don’t have time to learn how they work, you should do yourself a favor and use Clean Email instead. With it, you can set up automatic email filters with just a few clicks and clean up your inbox beyond recognition.